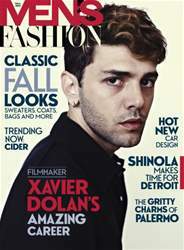 FASHION MAGAZINE presents MEN'S FASHION FALL 2014 featuring filmmaker XAVIER DOLAN. David Livingstone talks with the talented auteur about his style and his amazing career. Mike Randolph reports on discovering the not-so-obvious charms of Palermo. SHINOLA, believing in Detroit and making great products that will last. And Chef Steve Gonzalez serves up arepa with smoked chicken and guacamole. Plus, key colours and looks for FALL and Mark Hacking on seven new vehicles with outstanding automobile design.